Although I’m a big fan of Don’t Trust the B—- in Apartment 23, I wasn’t sure what to expect from Nahnatchka Khan’s new sitcom, Fresh Off the Boat, since it’s “inspired by” the autobiography of a celebrity chef I’ve never heard of, and centres around a young Taiwanese family chasing the “American Dream” in mid-90’s Florida… but after watching the first two episodes, I’m totally hooked! 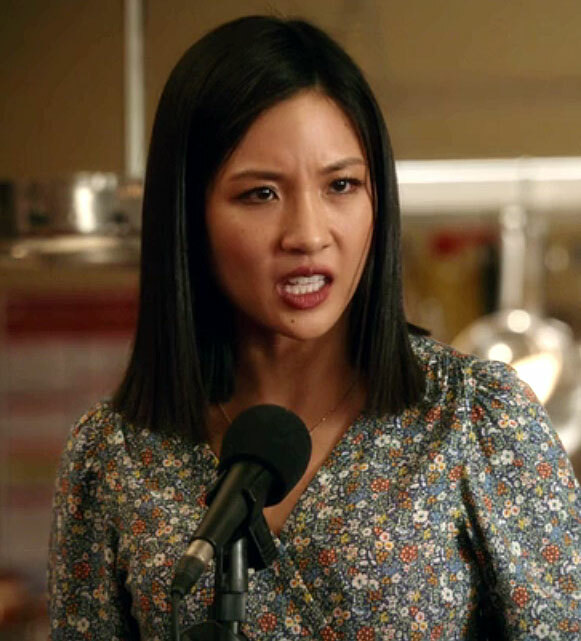 That’s largely down to Khan’s off-beat gag-slinging style, and the deft delivery of Constance Wu, who plays the family’s indomitable immigrant mother, ‘Jessica Huang’. She’s just a brilliant, beautiful, scene-stealin’, screen-ownin’ actress… and she gets a lot of the best jokes, as Jessica attempts to keep up with her Stepford-esque rollerblading neighbours, takes her disgruntled son to buy “white people lunch” at a sterile supermarket, or angrily demands that a school principal make her son’s tests harder after he comes home with straight A’s! And when she rammed a pair of smug d-bag customers with her car after they “dined and dashed” from the family’s struggling restaurant, I knew I was in love! (The show’s reality level is loose enough for them to survive without any serious injuries… but it was worth it just to see them get smacked down). Oh, she also has a very sweet singing voice… when she isn’t randomly berating staff members for minor, money-wasting infractions, that is! Apparently there’s been some tension between the show’s writers and the real Eddie Huang behind-the-scenes, concerning the tone of the series… and I have to say, it’s not a challenge I’d want to take on, trying to adapt a living person’s raw life experience into a weekly sitcom format… while also attempting to faithfully represent a minority community, and being funny enough to stay on the air. It’s a lot of responsibility to take on, and I’m really not qualified to comment on how well Khan has succeeded, in terms of honouring Huang’s vision or appeasing Asian-Americans… but for what it’s worth, I thought the first two episodes were chock-full of big laughs, sweet without being sappy, and sprinkled with sharp satirical observations. If the rest of the season is as good as this opening salvo (or better, even? ), then this could easily be one of the strongest sitcom runs we see this year. P.S. There’s a great interview with Khan over on the Entertainment Weekly site, about her role as executive producer. So go read it, already! This entry was posted in Rants about TV and tagged Constance Wu, Fresh Off the Boat, Jessica Huang, Nahnatchka Khan. Bookmark the permalink.